This is a large and very natural family. In order to illustrate its features we will examine one of our commonest bush flowers, Prickly Beauty. This flower is fortunate in having an original popular name all to itself. For once, the people who gave names in days that were earlier did not attach to this plant an old and quite inappropriate name belonging to a shrub at the other side of the world. Most people at all familiar with the bush know Prickly Beauty, know it as a small shrub, with small sharply-pointed leaves that are concave on the upper surface. The flowers are few in the upper axils, and are of the form so familiar to us all in the Pea-flower. For purposes of general information, any other of our native Peaflowers will do to illustrate, but as this family is very large and the members differ only on small differences, it has been thought necessary to divide them up into genera, marked very often by trivial differences, so in describing this flower it will be advisable to take note of these arbitrary marks, wherefore it is best to follow this article with a specimen of the true Beauty. As already stated, the flowers are few, and are placed singly in some of the leaf axils. They are not massed together at the ends of the branches as they are in many closely-allied shrubs. Each flower is on a distinct stalk. The calyx is made up of five sepals, but, unlike those of the Heath family, which are all separate from one another, here they are more or less united, so that the calyx is in the form of a broad tube, with five short lobes, and of these the two upper lobes are rather longer and more united than the lower three. Though apparently trivial, this is an important matter to whoever wishes to understand the classification of Peaflowers. The corolla is made up of five petals, which are very unequal in size. The upper one has a very narrow base, above which it broadly expands into a conspicuous disc, slightly notched on the upper margin; it is placed outside the other petals, and encloses them in the bud. It has received the name of the standard. Next are two small oblong petals, placed one on each side; they are called the wings. The next pair are placed below, and are more or less coherent along the lower margin, forming a boatlike space on their upper surface, in which lie the essential organs of the flower. These two lower petals are together called the keel. The petals are all yellow, more or less marked with purple-brown. This arrangement of the corolla gives to Peaflowers their peculiar appearance, which to some vivid imagination has recalled the idea of a butterfly. As the scientific name of a genus of typical butterflies is Papilio, so botanists commonly call Peaflowers papilionaceous, and give to the family the name of Papilionaceae. A thing that should be noted is that the petals are not attached, as in Heath, to the top of the flower-stalk, but to the inner surface of the calyx tube. The insertion is so close down that this is not very noticeable, but it is the commencement of the removal of the corolla from the top of the stalk that develops further in Roses, Saxifrage, and many other families, to culminate in the Myrtles and Umbellifers. It is a matter of first importance in the sorting together of different families of flowers. The pistil of a Peaflower is very simple. It consists of a single carpel, which develops few or more ovules. The pistil in the flowering stage is always slender. It lies in the centre of the stamens, in the cavity of the keel. From the end of the ovarian cavity it is prolonged in a slender style, which bends upwards towards the tip, so that the small terminal stigma comes to lie amongst the anthers at the end of the keel. 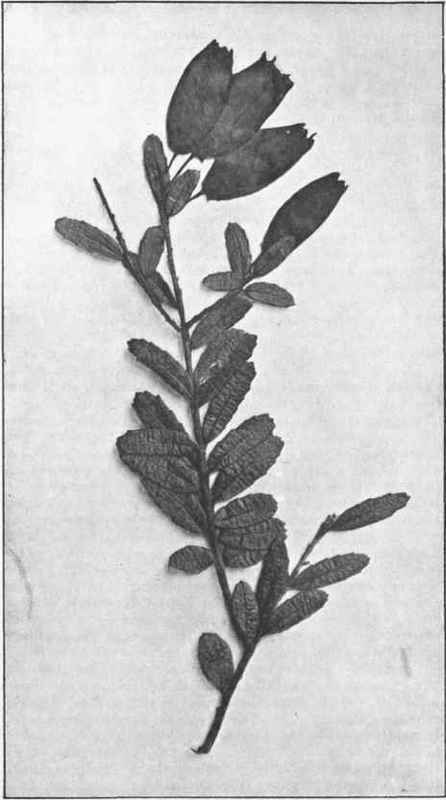 Comparison with other plants and study of malformations has led to the conclusion that a carpel is a modified leaf, and usually bears the ovules on its margin. This is easy to examine in a Peaflower, as no complication is introduced by the blending of many carpels. The carpel is a leaf which in our flower is bent together lengthwise, so that the margins meet together and the ovules hang down into the ovarian chamber from above. The fruit of a Peaflower is a legume, a form of fruit so well known to us in the Pea or Bean. On maturity, it splits along one or both margins to expose the seeds. The 3hape of the pod and the number of the seeds normally present are of interest, and are used to help to arrange the huge family of Peaflowers in groups. In Prickly Beauty the pod is very small, nearly round, splits principally along the upper margin, and contains only two seeds. Those who wish may note two details to assist in identifying the genus to which Prickly Beauty belongs, namely, Pultenaea. In many plants, at the base of the stalk of the leaf there is a pair of processes, arranged one on each side. They may be in form anything from large and leaflike to little spines or tubercules. They are called stipules. In the genus to which Prickly Beauty belongs stipules are generally, but not always, present, but when they are they are always small, brown, spiney bodies, and in this form they appear here. But a more constant mark of a Pultenaea is that there are two little stipule-like bracts, called bracteoles, placed upon the calyx.